Some “New World” Pinot Noirs are fruit forward enough to message your brain that the wine is a little sweet. This 2011 Domaine Michel Juillot Mercurey “Clos Tonnerre” Premiere Cru will definitely NOT do that. Mercurey is a village in the Cote Chalonnaise sub-region of Burgundy and predominantly produces Pinot Noir. It enjoys its own appellation (AOC) due to its terroir and its more quality focused appellation laws governing the AOC. Regarding maximum yields, for example, Mercurey more closely resembles those regulations of the Cote de Nuit and Cote de Beaune than the rest of the Chalonnaise. The same limestone bed that underlies the Cote d’Or extends south into Chalonnaise, but temperatures in the Chalonnaise are cooler and the fruit has a more brambly forest quality to it. Mercurey wines can offer value, and offer you a unique style rendering to round out your appreciation of the grape’s different presentations. I found this wine offered a strong nose of brambled cherry, and smooth, light to medium juice of fresh, light, sour cherry. 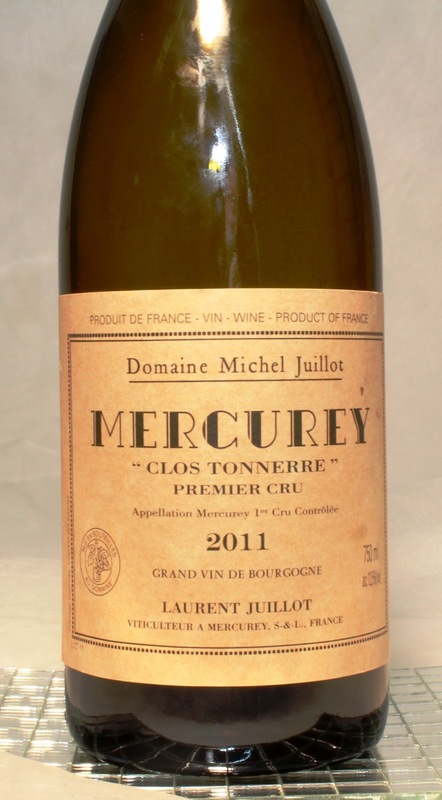 While more ageable than other Chalonnaise, Mercurey is a wine to be enjoyed younger than the more expensive Burgundies of the Cote d’Or, though one more year in the cellar might have been helpful taming this bottle sharp notes. Whatever your preferences in Pinot Noir, you will most certainly react strongly con or pro to Mercurey – and that is the whole point of the exercise. Tuition for your experience comes in at an ARP of $30. Should you be able to find a bottle from either the better 2009 or 2010 vintage, snap it up for immediate enjoyment. In either case, decant the wine, or recap the bottle and taste it again the second day to appreciate how it softens. Strikes me as a good companion to duck breast with cherry sauce or any sweet sauced BBQ. Follow Wine Mizer on FaceBook for recipes, fun facts and frequent wine reviews.